Daphne Hotel Apartments is located in the heart of Paphos and just a 20-minute car ride from Paphos International Airport. Its location puts it within easy reach of the beach and many fine restaurants that cater to international tastes as well as local ones, so whether it’s Italian, Mexican, Indian or just a good ol’ burger you’ll find it here. The great selection of bars is no less impressive either offering refreshing, cocktails, beers, wines and soft drinks. Paphos highlights are easy to see from Daphne Hotel Apartments, many of the historic sites and museums can be walked to whilst short car journeys will take you to the waterparks. Staying at Daphne Hotel Apartments itself, you will be treated to a comfortable, well-decorated room with all the essential amenities you’ll need for a stress-free stay. 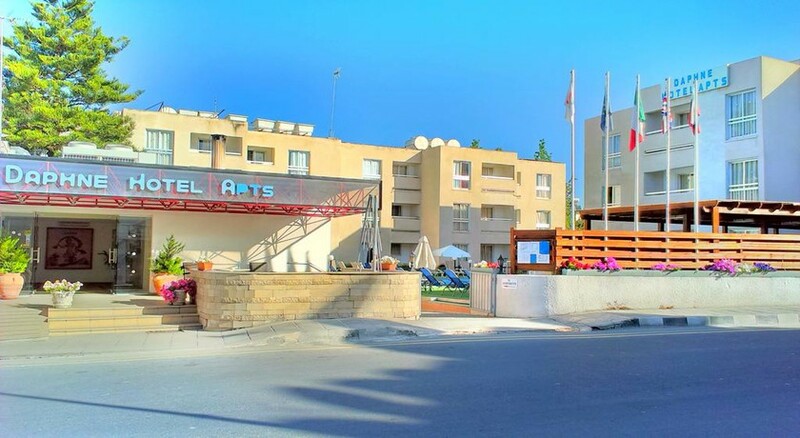 Daphne Hotel Apartments lies 16km from Paphos International Airport, meaning you can be at your hotel in under 30 minutes after arriving in Cyprus. The main beach access for guests is just a short walk away. Its location in central Paphos means top Paphos attractions are easily accessible from here. For instance, Paphos Archaeological Park is less than a 10-minute walk away and other historic sites that are close by here such as Forty Columns Fortress and Achille Mosaics are just two minutes further on. Paphos Waterpark is 4km away and takes just 10 minutes by car. You will find many top restaurants and bars within walking distance as well as souvenir shops and local food shopping. Daphne Hotel Apartments has 51 apartments altogether, which are well-furnished and tastefully decorated with neutral tones. 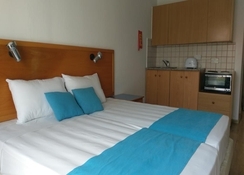 You’ll find the basic amenities for a comfortable stay at Daphne Hotel Apartments such as air-conditioning, telephone, safe deposit box, wi-fi, ensuite bathroom and more. All rooms come with a kitchenette that features a refrigerator and kettle so you can dine in. There is also a living area, so you can spread out and make a little home away from home and rooms typically feature a double bed. You can relax under the Cypriot sun on the private balcony. Daphne Hotel Apartments has two restaurants. One restaurant features an a la carte menu whilst the other provides a buffet. Both of these restaurants serve international and local favourites as well as having a children’s menu. Guests will also find a dining room where afternoon tea and drinks in the evening can be enjoyed. 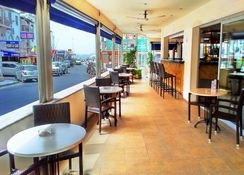 You don’t have to go far out into Paphos to find great places to eat and drink. 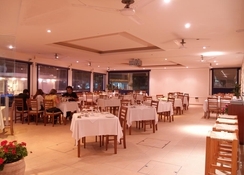 Nearby, you can find superb Japanese at Gold Sakura, delicious burgers at Grill Grande and traditional Greek and Cypriot dishes at Alkion Tavern to name but a few of the options. If you want to grab a late night drink, then head to The Wooden Pub, Flintstones or Bubbles Bar. Guests at Daphne Hotel Apartments will be able to enjoy the outdoor swimming pool which includes a diving platform or chill out under the sun on the terrace. Children will love the playground on-site. Take a relaxing meander through the hotel’s lush gardens. If you’re looking to absorb some of the rich cultural histories then take a 10-minute walk west where you’ll find the Paphos Archaeological Park, Medieval Castle and more. You can cool off and experience thrills at Paphos Waterpark just a 10-minute car ride away or head further north for a day trip to Paphos Zoo. 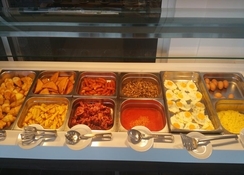 Fee for buffet breakfast is 4EUR per person. I did not expect much for the price. the staff were nice and friendly (especially Gemma on the bar) and the food was okay... Not a lot of variety and one night they ran out of the main meal and provided chicken nuggets and chips instead of the sweet and sour chicken that I was looking forward to. would go again if I was going on a quick break!